ONE°15, the first new marina to come to NYC in decades, will open this spring in Brooklyn Bridge Park. 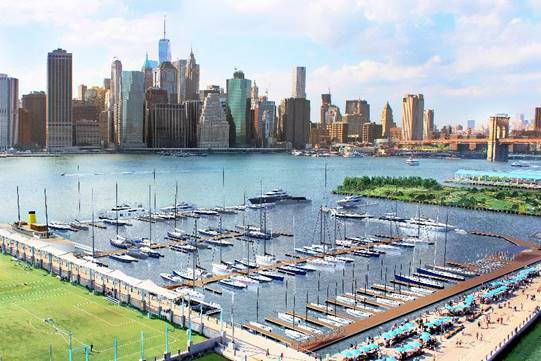 Currently under construction, the Marina is being outfitted with new docks and a state-of-the-art wave attenuation system, offering the calmest waters in New York Harbor. ONE°15 will offer 102 slips/berths, accommodating a variety of boats, ranging from 16′ to 250′. It will also feature a Sail Club & School and a members-only Harbor Club. The Marina is not only for wealthy boating enthusiasts. ONE°15 will dedicate two percent of marina revenue toward “exceptional community programming that will make boating and kayaking available to residents of all ages, abilities, and incomes.” Additionally, 25 percent of the dock space will be for community use. “In New York City we are surrounded by water yet there are so few opportunities to interact with the harbor,” said Regina Myer, President of Brooklyn Bridge Park.